(March 19, 2011) The Charlotte Observer reported in today's edition that Minorities are now in the majority in Charlotte according to the 2010 census. The article states that the population of Charlotte is 45.1% White, 35.0% Black, 13.0% Hispanic, and 6.9% Other. They also published maps showing Mecklenburg's Racial Population. The Observer's maps of Mecklenburg County show that races are not evenly distributed around the county. They show a high concentration of Whites in the northern part of the county, in a wedge through south central Charlotte, and along the Union County border. They also show a high concentration of Blacks in the immediate north, west, and southwest of central Charlotte. However, the Observer maps also show that many of the census tracts in Steele Creek have from 25.01 to 50% White and from 25.01 to 50% Black. 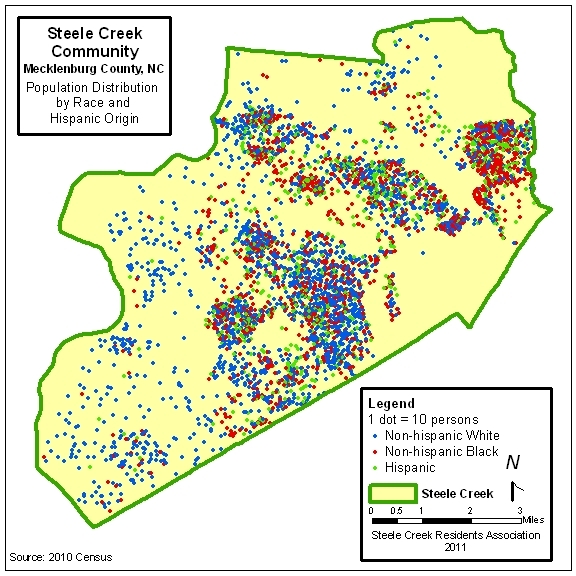 So Steele Creek, along with northwest, northeast, and east Charlotte, has a good mix of races, as the map below shows.